(FPRI) — Today, Islamic State foreign fighters bleeding out of Iraq and Syria power an unprecedented wave of directed attacks on three continents inspiring cascading waves of inspired violence from distant supporters scattered around the world. With that having been said, the good times for the Islamic State ended in 2016. Their decline has come as fast as their rise and points to yet another shift in global jihad. The jihadi landscape, in only three years, has transformed from the unipolar world of al Qaeda to a bipolar competition between the al Qaeda and Islamic State networks to a multipolar jihadi ecosystem with dozens of groups holding varying degrees of allegiance and affinity for their extremist forefathers. Al Qaeda and the Islamic State now represent two big players in a sea of militancy filled with many competing currents. As seen in Figure 10 below, the world of jihad has never been so vast, dispersed, and diluted. In the chart, circle size represents an imperfect estimate of a group’s relative size compared to other groups. Larger circles equal bigger groups, smaller circles denote lesser-sized groups and I can only make circles down to a certain size before the writing becomes illegible. More overlap between circles represents my estimate of greater communication and coordination between the groups. Sometimes I couldn’t overlap groups as much as I’d like due to space limitations and this being a two- rather than a preferred three-dimensional rendering. 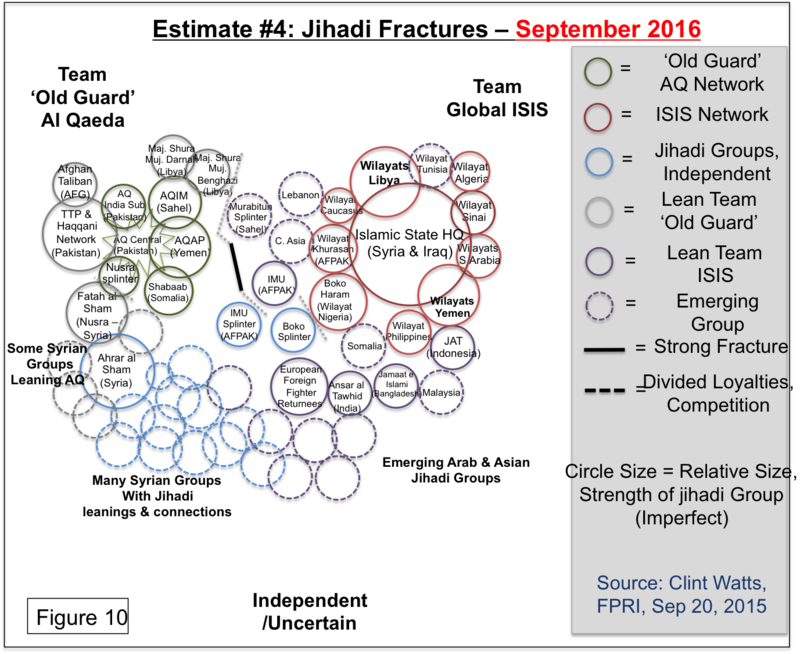 I’ve inserted dashed circles for what I anticipate to be emerging Islamic State affiliates or new jihadi groups of no particular leaning. I could probably list a dozen other names in the chart but to prevent excessive cluttering I’ve stopped with these names. (Many thanks go to Will McCants for insights on ISIS affiliates, J.M Berger as always for his social media prowess and Aaron Zelin, particularly this year, for further refining my perspective on the emergence of fractures.) For past estimates of al Qaeda versus the Islamic State, see depictions from February 2014, March 2014, and April 2015. Clint Watts is a Robert A. Fox Fellow in the Foreign Policy Research Institute’s Program on the Middle East as well as a Senior Fellow with its Program on National Security. He serves the President of Miburo Solutions, Inc. Watts’ research focuses on analyzing transnational threat groups operating in local environments on a global scale. Before starting Miburo Solutions, he served as a U.S. Army infantry officer, a FBI Special Agent on a Joint Terrorism Task Force, and as the Executive Officer of the Combating Terrorism Center at West Point (CTC).